Hi, This is my first attempt to do a write up, hopfully this can help some people out. Here are the tools that you need: 1. hose clamp 2. spring-band clamp pliers 3. Torx socket 4. flexible head socket wrench First, you need you to remove underside panel to get to the coolant hoses. Then clamp shut coolant hoses with hose clamps. Then, undo drain plug at water guide housing and collect coolant. Next, undo pring-band clamps with pliers. From the top: the shop manual says to remove the right hand seat, which I did not do, but I think you will have more room to work around. Then, remove service cover at passenger compartment rear wall. To do this, first remove rear-wall lining, then undo 9 hexagon-head bolts (10mm) and remove cover. Those with the drive belt in-tact, need to remove the belt first, my belt was destroyed by the water pump (1st pic), so I skipped this step. After the belt is off, you can now take off the water pump using flexible wrench, socket is 10mm. There are 7 nuts in total if I remembered correctly, and the bottom 2 nuts I managed to get it off from the under side. After all the nuts are off, take the water pump off, and remove it. You can see in the pic that mine is very very broken. From here, install is just the reverse, make sure to put in the seal, otherwise it will leak. Put everything back and fill up the coolant see if it leaks ( if you have tools to pressure test it, even better!) drive around and let the bubble out, fill up, then you're done! :D B) make sure when you put the belt back, put belt in in this sequence: water pump, alternator, intermediate roller, power-steering, air-con compressor drive pulley, crankshaft, idler roller, then over the tensioning roller. Make sure you use correct socket size for your size, 2.7 uses 24mm, 2.5 uses 19mm. The tensioner bolt on the 2.5 (and 3.2) is also 24 mm, or 15/16". Looks like the plastic impeller went bye bye. Were you able to account for all the broken pieces? I didn't know that changing out the water pump is this easy. By chance I was talking to a mechanic a few days ago about the use of a plastic vs. metal impeller, since it appears aftermarket pumps have a metal impeller. This mechanic works at a dealership so he has never seen a metal impeller pump on a Boxster, as that is not what Porsche uses or sells. He did say that VW use to use a metal impeller and when the bearings failed the impeller would grind away at the aluminum engine case, and perhaps that is why Porsche uses plastic. Most of the broken larger pieces of the plastic impeller should be right behind the pump when you remove it. The smaller pieces are bye-bye, and your engine is not taken apart to find them. The tensioner is spring loaded and self adjusting. To remove the tension from the belt so you can get it on and off you turn the nut on the end of the tensioner clockwise. The nut does not actually move. The nut moves the tensioner pulley away from the belt. There is nothing to tighten. You will figure this out when you get in there. thanks tool pants...i feel like an idiot asking that question about how much to tighten the tension...i dont know what I was thinking... :lol: ...but find out today too that I need a new belt drive...man, this just keeps getting better and better...i'll probably replace the thermostat since i already drained my coolant...what are your thoughts??? Not at all, because I have owned cars in the past where you did have to lock down a belt tensioner. But they were cam belts, and all you are going to replace is a fancy fan belt. You can even drive the Boxstir without the belt on, but then it is hard to turn the steering wheel. As for the thermostat, you leave it alone. Murphy's Law. The water pump has a reputation for failing after X miles, not the thermostat. Once everything is back together you need to bleed the air out. cool!!! I found some thread that you just leave the coolant cap off overnight and this should let the air bubbles out..is this true?? ?the other thing I did too is, before I did it, I asked the dealership what kind of coolant I can use. He said that I could use any coolant as long as it is 50/50...so, I used prestone to top it off(this was before I located the leak)...now, i read on one of the thread that i shouldn't mix it and should stay with porsche coolant...and if mixed, it will form a jelly like coolant..can I just flush it with distilled water before I added the porsche coolant with 50%distilled water?? No, just leaving the cap off will not bleed air out. You need to open the bleed valve for a few days and check/top up the level at least daily until it stops going down. If you are doing a complete flush any good coolant for alloy/aluminum engines should be fine. Porsche's coolant is organic. Remove the caps then the plastic plate under the caps. 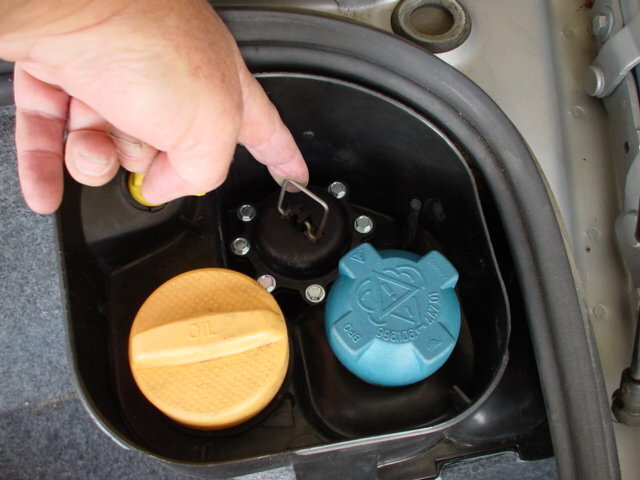 To open the bleed valve you lift it metal lever up and it will stay in the up position. Lift up on the lever. Warm up the car a while and keep the tank full. Put the cap on run the engine at 2,500 rpms for 10 minutes to get the thermostat opened. Make sure the tank is still filled. Run the car at 2,500 again for 5 minutes and every 30 seconds briefly rev the engine up to 5,000 rpm. This is for a manual transmission car. Tiptronic has a valve that needs to be opened. All this is for a car in a shop setting. When I bled my system at home a few years ago I filled the tank. Put the cap on and lifted the lever. Then I went for a 20 minute drive. I brought water with me in case the low level warning light came on to top off the tank, but it did not. When I got home I filled the tank to the max and closed the lever. thank you very much..I appreciate all the tips and the time you took to answer all of my questions...still waiting for the parts i need..once i get it(hopefully tomorrow) I can start putting things back together..
Based on the fact that the OEM Porsche part uses a plastic one instead of a metal one incase it explodes and rubs on the engine case, would it be better to purchase the Porsche OEM part over an aftermarket one? I need to replace mine and I have found several brands ranging from $98.00 cheap - OEM Porsche $315.00 - AC-Delco $545. Is there any to stay away from? $300 is list price from Porsche - have you tried a quote from Sunset Imports (Porsche Parts at Dealer Cost) - just click the link near the top of any page. First, you need you to remove underside panel to get to the coolant hoses. Then clamp shut coolant hoses with hose clamps. Then, undo drain plug at water guide housing and collect coolant. Next, undo pring-band clamps with pliers. From the top: the shop manual says to remove the right hand seat, which I did not do, but I think you will have more room to work around. Then, remove service cover at passenger compartment rear wall. 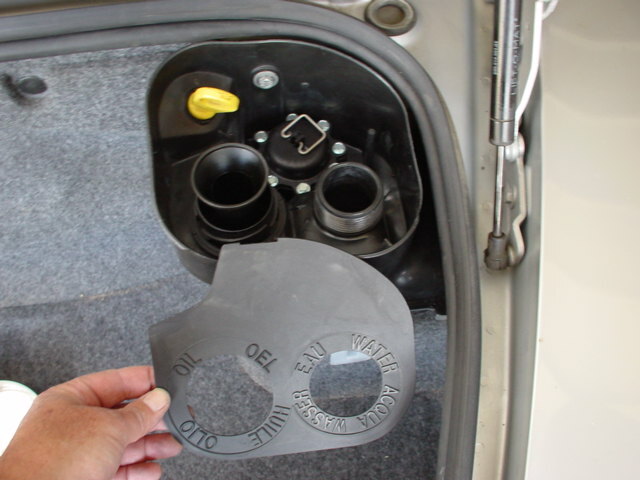 To do this, first remove rear-wall lining, then undo 9 hexagon-head bolts (10mm) and remove cover. Those with the drive belt in-tact, need to remove the belt first, my belt was destroyed by the water pump (1st pic), so I skipped this step. After all the nuts are off, take the water pump off, and remove it. You can see in the pic that mine is very very broken. 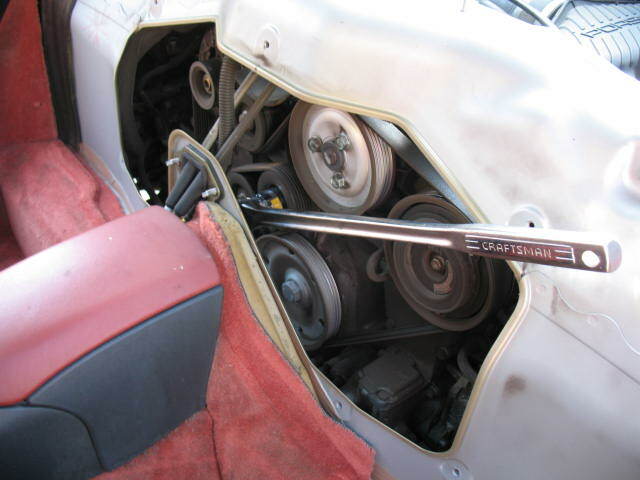 make sure when you put the belt back, put belt in in this sequence: water pump, alternater, intermediate roller, power-steering, air-con compressor drive pulley, crankshaft, idler roller, then over the tensioning roller. Make sure you use correct socket size for your size, 2.7 uses 24mm, 2.5 uses 19mm. The hose is just stuck on there from the years and heat cycles during which it has been on there, along with maybe some dried coolant. You can use a plastic "spoon", which is used by upholstery or windshield shops and work it slowly around the perimeter of the hose. Don't use a metal tool unless its edges are rounded and smooth, otherwise you may run the risk of poking a hole through the hose. There are 2 bolts on the water pump that are longer than the others. Can anyone tell me where they go? I know one came from the top. 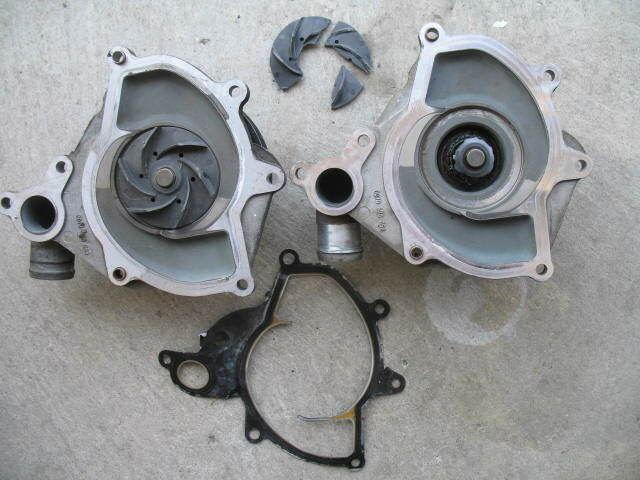 Since changing my water pump (2000 Boxster S Tiptronic) the fans do not come on. I have bled my system with the B1 fuse removed and the temprature needle sits on the right hand side of the '0' on the 180 in traffic. Where Toolpants mentioned ' Tiptronic has a valve that needs to be opened', is this done manually? Is there anything I missed? Okay Gentlemen "Trixie" is sick and needs your help! Her serpentine belt broke and the water pump impeller exploded into bits. Doctor says it'll be eight hundred bucks to get her healthy again. Thing is, finances are tight due to my unscrupulous employer so I'll be performing the surgery myself. What's the worst case prognosis on a procedure such as this? I'm concerned about the bits in her engine and how precisely to get them out. I'm a novice at best but I'm reasonably intelligent, can turn a bolt and from time to time I can even follow instructions. I did do a slew of research before I posted this but I didn't come across the impeller problem. The belt broke, no steam, drove to a safe location, tried to start again to no avail only saw dashes on my display and would not turnover. What could it mean? What are the pitfalls of the death of my impeller? Worst case scenario? Def-con 5? How do I get them out? Should I really attempt this? A checklist of necessary tools would be monumentally helpful. Also a checklist of steps would be great. Thank you in advance guys, my love affair with Trixie wouldn't be the same without you. Please do not double post - your question were already answered in your first post.